…Enjoying the wonderful changes in the seasons and most importantly, the food! The holidays bring out the best that food has to offer, and I’m its biggest fan. The more pumpkin pie, the better. The only thing that I hate during the holiday season is the extra weight that I tend to pack. With such good food what can you do? Well, I finally found the answer and I’m going to share it with you so that you can enjoy the pie but not feel the guilt or the pounds. During the fall and winter, it gets harder and harder for me to stay motivated to go run or a ride bike. The weather and the cold tend to shorten my work outs more and more. This is really not a good thing if I want to keep that winter weight off. So, during this cold time of year, I rediscover my local pool and the joys of the lap swim. But that is where you are wrong. While running does burn the most calories, swimming laps for an hour at a medium pace comes to a close second. Plus, while running puts a lot of stress on the knees and ankle joints, swimming is really low impact. What that means is that you can swim everyday and burn off that extra slice of pumpkin pie! If you want that extra slice of pie, and I think we all do, then let me recommend a few other water work out tricks that will burn those calories. First, I would recommend doing some treading water exercises. Try this: as you swim laps, on every fifth lap, stop and tread water with your arms up using only your legs for one minute. If that isn’t enough work out for you, then I recommend buying a drag shoot. These devices make it more of a challenge to pull yourself through the water. If you want more pie, these workout extras will make you earn it. It can be hard to keep up a good pace as you swim or to know when you have tread enough water. 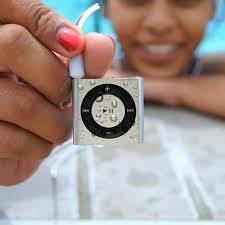 To help with that, I recommend buying a waterproof iPod shuffle from Underwater Audio. With this little device, you can use music to time your workouts and help you keep a calorie burning pace. If you have any other thoughts or ideas on keeping the holiday weight off, please feel free to post a comment below. Enjoy the swim and the pie!